Saint Lucia is a small island country located in the eastern Caribbean Sea. It is believed to have been discovered by the Europeans in the late 15th or early 16th century. The island was named after Saint Lucy, a Christian martyr who died during the Diocletianic Persecution of Christians in the Roman Empire. The feast day of St. Lucy is celebrated on December 13, it is Saint Lucia's National Day. The holiday marks the beginning of the Christmas season. Its celebration involves numerous religious, cultural, sporting, social, and commercial activities. They include the National Festival of Lights and Renewal, the National Festival of Choirs, a festival of bands, and a market festival. The Festival of Lights begins on the eve of St. Lucy's day. The citizens of the capital city of Castries light numerous decorative lights. The festival also includes a decorated lanterns competition and a fireworks display. 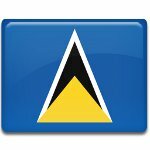 National Day of Saint Lucia must not be confused with the country's Independence Day. Independence Day in Saint Lucia is a separate holiday celebrated on February 22.